Writers’ Rumpus points out the “five fabulous things” about the book: Oliver, the illustrations, the turning point, back matter, and the “subtle, sweet, important” message. Reading Style Guide notes that Crute explores the “ever-present phenomena” of the obsession with being first, and admires the “insightful details” of the illustrations. 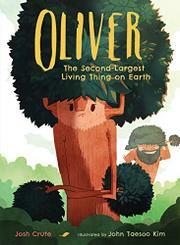 Grab your copy of Oliver: The Second-Largest Living Thing On Earth here. Shaking Things Up with illustrations by Shadra Strickland is out today! Great Review From Kirkus For Michael Slack’s Upcoming Shorty & Clem Blast Off!